MALHEUR NATIONAL WILDLIFE REFUGE, Oregon (Reuters) - The doorknob rattled. Two of the men occupying a federal biologist's office in a stand-off over land rights hopped from their chairs and swung rifles toward the locked door. There was no knock - the established procedure for gaining entry to the nerve center of the siege mounted by brothers Ammon and Ryan Bundy at this eastern Oregon nature center. 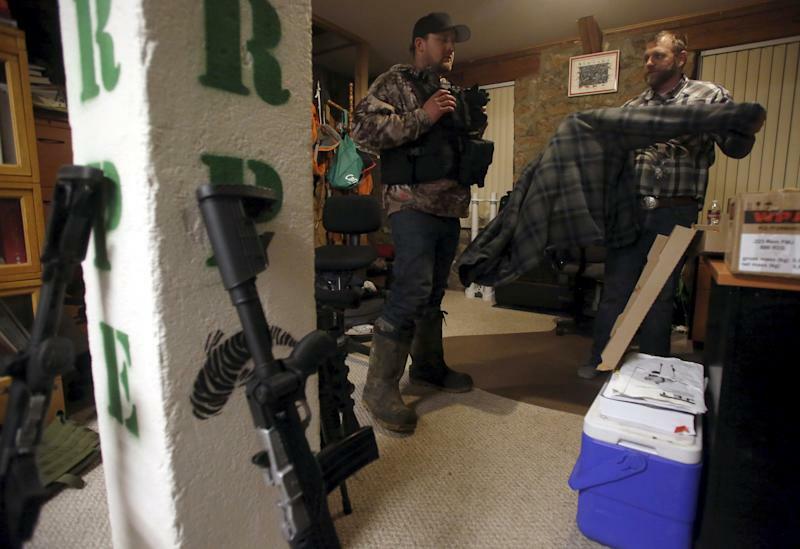 The Bundys’ bodyguard stood in silent alert but heard no voices from the snowy darkness outside. "Should we approach the door or not?" Ryan asked, creeping toward a window. Ammon, armed with only a cell phone, remained seated and shook off the tension, saying dryly, "Oh, it's fun to live this way." Since Saturday, the brothers and a small band of supporters have occupied the Malheur National Wildlife Refuge, which they seized to protest the U.S. government’s control of vast tracts of Western land. On Tuesday, for the first time, they allowed two reporters to join them inside their refuge for a night marked by long discussions and moments of hair-trigger tension. Earlier, the Bundys had heard from people they trusted that federal law enforcement agents were assembling in Burns, the nearest town, a half hour’s drive away. Federal officials have said they have no plans to approach the refuge. As the two Reuters reporters arrived just after nightfall, the occupiers were moving into a state of high alert. The group's head of security, a man known as Booda Bear, had been out of touch since driving off-site hours earlier. Amid efforts to locate him, the Bundys talked at length about what had brought them into this wilderness - and what it would take for them to leave. They began the occupation after a demonstration in support of two ranchers convicted of setting fires on their land that spread to this reserve. Dwight Hammond and his son Steven were sent back to prison this week after a judge ruled that the sentences they previously served for arson were not long enough under federal law. 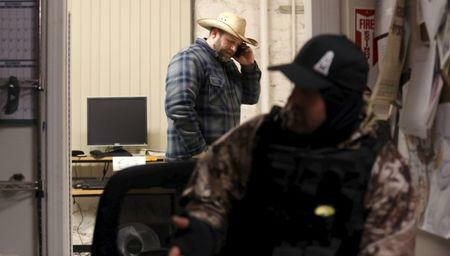 For the Bundy brothers, the occupation is personal. Their father, Nevada rancher Cliven Bundy, who was not at the reserve but was offering his sons advice by phone, became a symbol of the anti-government ethos after a stand-off over grazing rights with federal authorities in 2014. When the brothers heard about the Hammonds' legal troubles, they felt a need to show support and confront a federal government they believe tramples on local control. But how the occupation will end still isn’t clear. "When we can say, 'OK, now we can go home,' would be when the people of Harney County are secure enough and confident enough that they can continue to manage their own land and their own rights and resources without our aid," Ryan Bundy said. "And we intend to turn this facility into a facility that will aid that process." To underscore his point, he grabbed a piece of paper from the office printer. It featured a new name and logo the group had decided on for the Malheur refuge, which plays host annually to a wide range of migrating waterfowl. In the Bundy-designed logo, the words "Harney County Resource Center" float over an image of the reserve's horizon in the glow of dusk. The brothers have taken over the cozy and cluttered office of Linda Sue Beck, a biologist and civil servant they have come to view as a symbol the federal government. They said they would allow Beck to come to gather her personal belongings. But they don’t want her to return to work. He referred to her as the “Carp Lady,” a nod to the fish-themed block prints and “Carpe Carp” sign on her office walls. 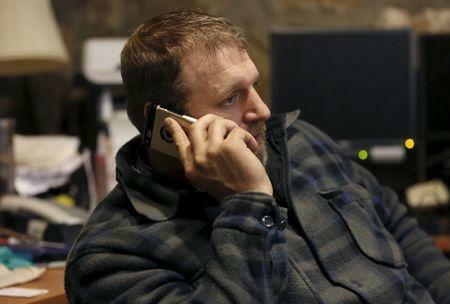 Ammon Bundy sits at her desk with his laptop, making and taking call after call with journalists, supporters and local government officials. A birthday card, a book called “Fisheries Techniques” and other office adornments appear largely undisturbed, save for a spot on Beck’s desk cleared to make room for boxes of pizza and bullets. The protestors make coffee in an adjoining kitchenette that doubles as a science laboratory. The occupiers have spent some of their time collecting evidence to press their case. Ammon Bundy worried aloud about a video recording stored in his cell phone of what he says is an eyewitness raising questions about the government case against the Hammonds. “If they kill me, grab my phone,” Bundy said. Upstairs in the building, Wes Kjar, a 31-year-old occupier from Utah, showed reporters around a box-filled storage area, dominated by the body of a huge bird stashed upside down atop a cabinet. Kjar left a job on an oil rig to join the siege over the weekend, meeting Ammon Bundy for the first time. He stayed to serve as his bodyguard and speaks with passion about the cause. He said he would not hesitate to stand between Bundy and a bullet. Much of the night was spent chewing over scenarios for how the siege would end and what would become of the occupiers, including returning home, facing prison and dying. Ammon Bundy said he would not resist arrest, but he would not cooperate with any prosecution he deemed unconstitutional. He said he is encouraging county residents to convene a grand jury to rule on whether the federal government’s jurisdiction over the reserve is proper. He also is seeking the indictment of the government lawyer who prosecuted the Hammonds. Before climbing into sleeping bags, the Bundys, bodyguard Kjar and two others sat in a circle discussing the day’s lessons and making plans for the next. After hours on high alert, the group had come to believe that the tip they had gotten earlier about a planned overnight raid was actually a red herring planted by the federal agents in an act of psychological warfare. And they decided there were some purported supporters they would no longer trust. “They were trying to see how we would react to the imminent threat,” Ryan Bundy offered. The doorknob rattle remained a mystery.